Our trip to Atchison for the 10th Annual Amelia Earhart Festival was very productive and we were very fortunate to get on-camera interviews with many authors and researchers. This footage is for informational purposes only and will not be included in the commercial feature film (the feature movie is based on a dramatic screenplay and is not a documentary). We would like to thank Louise Foudray, Caretaker of the Amelia Earhart Birthplace Museum, and The Ninety-Nines for their hospitality. 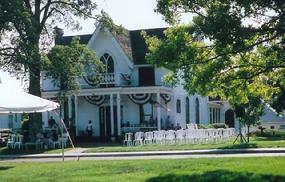 The home was built in 1861 on a high bluff that overlooks the beautiful Missouri River in Northeast Atchison, Kansas. Amelia Mary Earhart was born in this home on July 24, 1897 where she and her younger sister, Muriel, spent much of their childhood school years. These early childhood years were happy ones for Amelia and Muriel and greatly influenced their adult interests and accomplishments. Amelia’s early love of travel, spirit of adventure and scholastic achievements were later reflected in her many flying records, fashion designs and public speaking on aviation and women’s rights. In Carol Dow’s screenplay, there is a wonderful scene involving a homemade roller coaster in the back yard, and it is still there to this day! A special thanks also to the Atchison Public Library staff and the “Breakfast with the Books” program featuring Kimberly Kiler and Carleen Grossman, authors of new children’s books about Amelia, and presentations by authors David Bowman, Joe Klaas, Dave Bellarts, Elgen Long, The Paragon Agency publisher Douglas Westfall and a question/answer session with George Putnam, Jr. Another thanks to photographer Donald Martin who provided an exceptional side trip to The Amelia Earhart Earthwork at Warnock Lake (a one acre landscape mural by Kansas artist Stan Herd created to celebrate Amelia’s 100th birthday on July 24, 1997) and to the International Forest of Friendship, a living memorial to aviation and aerospace pioneers with trees from 50 states and 35 countries and a life-size, bronze statue of Amelia Earhart. "Spirit of Military Women in Aviation"
Colonel Cathy Clothier, recipient of the 2006 Amelia Earhart Pioneering Achievement Award. With over 2,600 flying hours during her career, she has recently moved to the Pentagon as the Director, General Officer Management for the U.S. Air force. Margaret Ringenberg, former WASP and octogenarian pilot and air race competitor. Lieutenant Brandi Staniec, squadron and wing commander. Colonel Jacqueline van Ovost, Joint Operations Division Chief, Operations and Plans Directorate. Major Toni Truelove, air traffic controller and member of the Army National Guard. Moderator Cathy Cray Dawes (News Director, Manhattan Broadcasting and Edward R. Murrow and Associated Press award winner) brought the panelists together to discuss their own experiences and share their spirit of adventure and service. Colonel Cathy C. Clothier was Commander of the 22nd Air Refueling Wing, McConnel Air Force Base, one of the three core Tanker Wings of the Air Force. The Wing provides KC-135 Stratotankers worldwide in support of United States and allied military. She deployed for Operations Enduring Freedom as the Commander, 462nd Air Expeditionary Group; and Iraqi Freedom as the Commander, 401st Expeditionary Operations Group. She also deployed as the Central Command Air Forces deputy Directory of Mobility Forces. 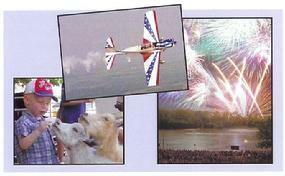 Festivities included free birthday cake at the Lewis and Clark Pavilion in Riverfront Park, Aerobatic performances over the Missouri River by Gary Rower, Ken Stout and the Dave Dacy-Tony Kazian Super Stearman Wingwalking Team and one of the Midwest's most dazzling fireworks shows orchestrated to music by Paul Austin Pyrotechnics of Wichita. Filmmakers delve into the decades-old mystery of the Kansas native. The fate of Atchison native Amelia Earhart, the famed aviatrix who in 1937 disappeared while flying across the Pacific, will be the subject of a feature film based on a screenplay by a former Kansas Citian. Executive Producer Felix E. Girard and screenwriter Carol Dow were in Atchison this weekend for the annual Amelia Earhart Festival. 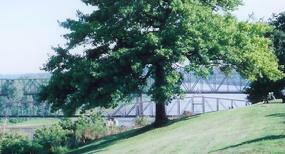 They�re videotaping interviews with visiting Earhart scholars. 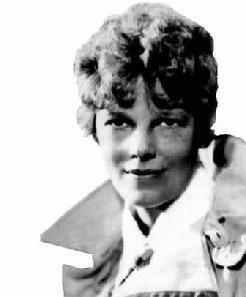 �We�re really excited about meeting as many Earhart people as we can,� Girard said last week in a phone conversation from his offices in Burbank, Calif. �The Lost Flight of Amelia Earhart� will be a drama, not a documentary, and will center on her final flight and the mystery of what happened. Dow, who now lives in Dallas, said the story is framed by a newspaper reporter�s investigation. The evidence, Dow said, strongly suggests that Earhart and her navigator, Fred Noonan, were captured by the Japanese and later died in captivity. �They could have been prisoners for as long as two years,� Dow said. �Whether she died of dysentery or a firing squad or her head was chopped off, I don�t know. 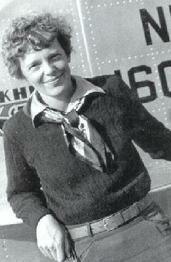 Girard said that 70 years after Earhart vanished, she�s more popular than ever. The film�s Web site, www.ameliaearhartmovie.com, gets 30,000 hits a month, with many visitors making suggestions about casting the film. �Some of the front-runners right now are Kate Bosworth, Cate Blanchett, Hilary Swank � even Nicole Kidman,� Girard said. At this point, though, casting is a bit premature. Dow, who in the �80s published the stock market report Dow Digest from Kansas City, began writing her screenplay about seven years ago. It was inspired in part by her friendship with Earhart�s sister, Muriel, whom she met more than 20 years ago. last weekend for a feature film about the famous aviator. Executive Producer Felix Girard and screenwriter Carol Dow visited Atchison to attend the Amelia Earhart festival and prepare for their upcoming film, "The Lost Flight of Amelia Earhart." Mr. Girard and Ms. Dow videotaped conversations with authors, experts and locals about Ms. Earhart. The script follows the aviator through her final flight and capture by the Japanese. Ms. Dow, who spent five years writing the screenplay and many more researching, is convinced that Ms. Earhart crashed into Japanese territory and later died in captivity. "The longer I researched, the more I realized that's what happened," she said. "There's no question about it." Mr. Girard, from his studio offices in Las Vegas, said they are in the process of funding the project and have not started casting. They want an actress who can play off of the tomboyishness that was a part of Ms. Earhart's personality, he said. Visitors to the Web site suggested actresses including Hilary Swank, Charlize Theron and Cate Blanchett, who Ms. Dow would like to see in the role. "Everyone wants Cate Blanchett," she said. "You have to wait in line." An overview of the movie on www.ameliaearhartmovie.com explains how eyewitness accounts and evidence in a Japanese prison formed the basis of Ms. Dow's script. Louise Foudray, caretaker and tour director of the Amelia Earhart Birthplace Museum, met with Mr. Girard and Ms. Dow last weekend. She said writers and producers occasionally visit the museum for information, but films often are shelved. It's difficult to weave together all the different theories, she said. "Anyone putting it together has got to be quite skilled," she said. Mr. Girard is determined to finish the movie within two years. He said most of the filming will be on the West Coast, with a possible return visit to Atchison.